Complement your winter event with our self-standing cards adorned with a classic metal snowflake Christmas ornament wedding favor. Ornament cards provide a great way to show your guests to their seats while treating them to a memento that can be used for years to come. Each card is imprinted with a snowflake background design and measures 4" x 5". Ornament measures 2.5". For an extra fee we will include a clear label imprinted with a special message or your names and event date. Please note that personalization is done in the font example pictured (line 2 is smaller). Some assembly required to attach self-stick labels to the cards. 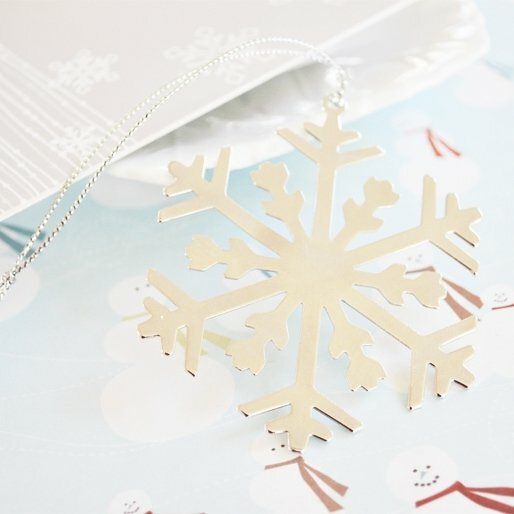 How can i print the information for the snow flake ornamenent? You need to add this Snowflake Christmas Ornament Wedding Favor Place Card to your shopping cart and you can personalize it from there. Are these place cards stand alone or do they have to be set in a stand? 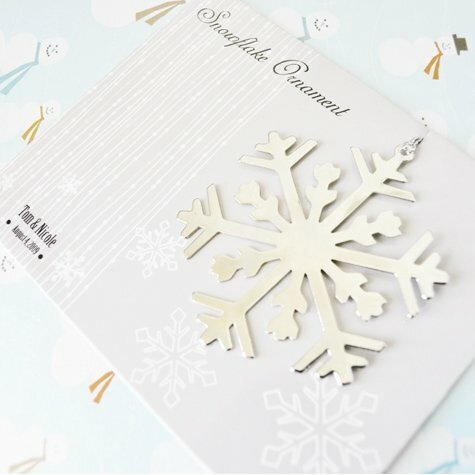 This 'Snowflake Christmas Ornament Wedding Favor Place Cards' are self-standing cards. 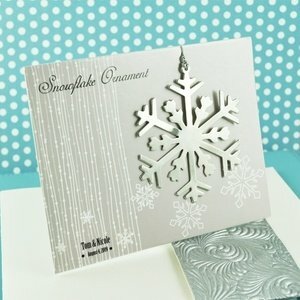 Each card is imprinted with a snowflake background design and measures 4" x 5". The onament measures 2.5". For an extra fee we can also include a clear label imprinted with a special message or your names and event date.